Monarch, Nikon’s popular line of binoculars, has a solid reputation for offering quality optics for practically any use. Highly versatile and marked by excellent glass and durable builds, the current lineup features multiple magnification options at price points ranging from $300-$100 for the Monarch 5, Monarch 7, and Monarch HG binoculars. We reviewed each of the current Monarchs to offer you full reviews on this sought-after series of mid-range and premium binoculars. The Nikon Monarch HG is the latest in Nikon’s monarch line of binoculars. It comes in the 10×42 and 8×42 versions. This version of the Monarch series is the quintessential rugged outdoorsman binoculars. It is constructed of magnesium alloy, a stronger substance and coating to protect against damage from drops and other accidents. The HG is nearly double the price of the binoculars that preceded it, the Monarch 7. They both have the ED (extra-low dispersion) glass that clears up distortions in imaging and augments the Field flattener lens system. The HG isn’t a vastly different pair of binoculars compared to its predecessors but really ups the ruggedness factor. Apart from being shielded and coated with anti-fog and moisture material, the HG prides itself on being the best pair of sporting optics out there. Being rugged and during is one thing, but retaining image quality is another. The focus is still in the center between the eyepieces and takes on a larger shape for increased control and stability. The Monarch HG utilizes the field flattener lens system (FFLS) like the rest of the Monarch line. With most imaging devices including cameras, a notable problem is a dropoff in image quality and color around the edges of an image. Monarchs compensate for this problem with the FFLS, clearing up images on the outside to make a complete and colorful viewing experience. Nikon has increased the level of coating for the HG’s internal prisms and lenses, leading to a nearly 92% light transmittance factor. For low-light and unfavorable conditions, the HG is the pair of binos for the job. The HG employs a 60.3-degree FOV for the 8×42 pair and 62.2 FOV for the 10×42 pair. A two-degree difference doesn’t seem like much but can mean the difference between spotting a rare object or animal at long range. The HG also has a diopter setting that allows you to save your preferred setting in the case that you share these binoculars with another person. It is rated waterproof above 5m for around ten minutes and fog-proof at altitudes of up to 16,400 feet. These stats showcase just how rugged this pair of binoculars is. That’s not to say that the entire Monarch line is sub-par, but the HG is ideal for harsher conditions where other binoculars might suffer performance issues. The most recent release of this line is the new 30mm Monarch HGs. These two are more compact than the 42mm binos, and an 8-ounce weight reduction makes them extra portable. Nikon’s Field Flattener Lens System works with a FOV that matches the 42mm—8.3° and 6.9° respectively in the 8×30 and 10×30 models. A good pair of binoculars is optically clear, compact enough to be easily carried, and durable enough to withstand unusual conditions. 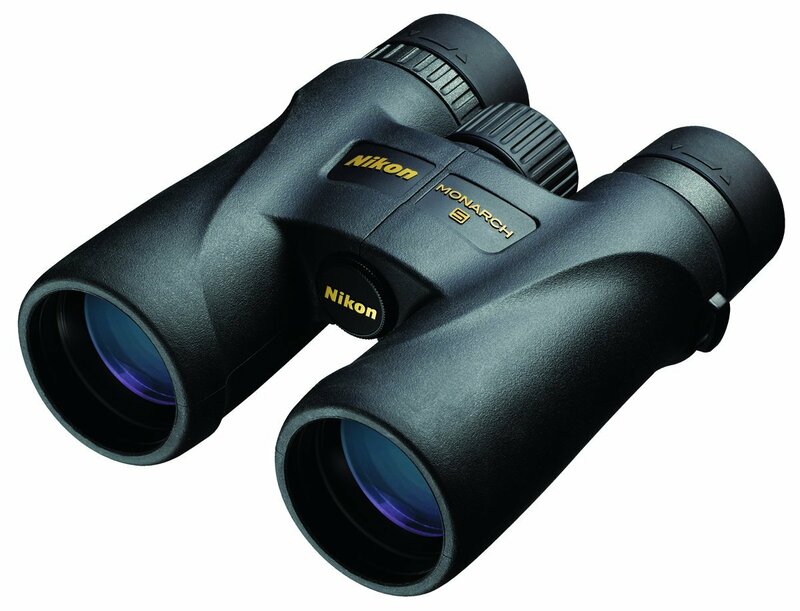 Nikon Monarch 7 binoculars meet all of these criteria. By combining the best in optical technology with a sturdy, well-engineered design, Nikon has made a pair of binoculars that will meet almost any need. Priced in between the high-end HG and the Monarch 5, the 7 is a great option for anyone looking for a step up from the 5 with a stronger build and wider field of view. 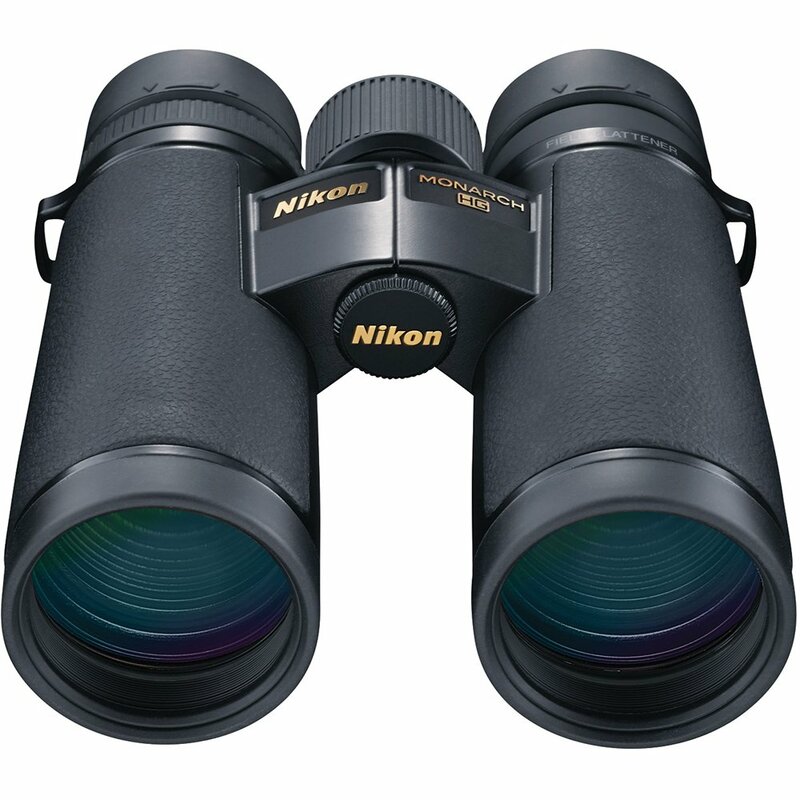 The Nikon Monarch 7 binoculars feature low dispersion glass, phase correcting roof prisms, and dielectric high reflection prism coatings to make the optical image created for the viewer as clear and true to life as possible. All of these elements combine to make a very high fidelity viewing experience, as well as to ensure that glare or other light phenomena do not compromise the view. In addition, scratch resistant coatings are applied to all exterior lenses to guard against damage. The binoculars are also sealed with o-rings and filled with nitrogen gas to maintain a water-resistant seal that is effective in up to 3 feet of water for up to 10 minutes. Owing to the durable casing and the many protective features designed to protect the optical components, these binoculars are up for just about anything that may get thrown at them. These are ideal as sporting binoculars and would do well on a nature excursion or in other sporting situations. Nikon Monarch 7 binoculars are quite good optically. The many glare and refraction reducing features create an image that is clear and not distorted or fuzzy. These same optics also present the viewer with a very true to life representation of color and brightness. They are also extremely durable, allowing them to be taken on hikes, nature outings, bird watching, or just about any other expedition you may have in mind. The optics produce a very clear and undistorted image that is both bright and colorful. The same features that make the binoculars water resistant also serve to keep it sealed against atmospheric humidity, preventing the lenses from fogging up and producing a blurry image. One of the first things you’ll notice right out of the package is that the Monarch 5s feel well made and sturdy. They are also relatively lightweight for this price point, so you won’t feel like you’re lugging bricks around your neck all day. The rubber armoring makes it easy to hold. The twist-up eyecups are comfortable, as is the 18mm eye relief. Adjustments are easy to make, and the focus wheel works incredibly well no matter what your hands are covered in. These are very well made, and designed with the elements in mind. 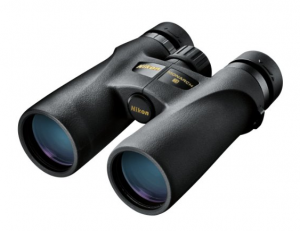 Nikon Monarch 5 binoculars are filled with nitrogen, which makes them completely fogproof. For anyone who has experienced the frustration of lenses that fog up, you will be super impressed by how well this fogproofing works. Additionally, the Monarch 5s are waterproof (for up to 10 minutes at a depth of up to one meter). The Nikon Monarch 5 is very popular with bird watchers, hikers, and hunters. The design features support the needs of those populations. And, the multi-coated lenses mean that the true color comes through. The overall visual quality is outstanding. You’ll see crisp, clear views with great detail. We tested these alongside comparably priced binoculars with similar specs, and the Monarch 5s were the clear winner. The lightweight design gives it a competitive edge, but it really comes down to eye comfort and the stunning quality. The Monarch 5 is a great pair of binoculars that will work well for a number of uses. Whether you want to take them hiking to check out wildlife, keep them in your vehicle for your birdwatching excursions, or keep them close on your hunt, they will work wonderfully. We can’t wait to get these back outside for hunting season, or even just to bird watch. Overall, the Monarch 5 is well worth the money and will last you a long, long time. There’s a fairly significant price hike between each of the Monarch iterations, so budget tends to be the main factor when it comes to deciding between these Nikon binoculars. However, you might be wondering about differences between them beyond the sticker price, so here’s a quick look at what you get when you pay more. Build Quality: With each step up, you’ll find a better, more durable build. This is most notable when you get to the Monarch HG, as those are made from magnesium alloy. This ensures an excellent level of durability while being lightweight and compact. There is minimal difference between the 5 and 7 in build, however. Glass: Similarly, in any line of optics including Nikon Monarchs, a step up in price also equals higher quality glass and higher-tech coatings. For most casual users, the difference in glass isn’t necessary, but it does make a big difference in viewing quality as you compare low-to-mid and premium optics. In the Monarch line, the biggest difference in glass comes between the 5 and the 7. Specs: When crunching the numbers, each Monarch iteration boasts a slightly better set of specs, such as FOV and radius. This is also related to configurations, too, of course, so definitely check out the specifics on the configuration of the model you’re interested in. Performance: The factors we’ve previously discussed plus the guts of each option equal better performance as you pay more. For example, the 7 and HG perform better in low light situations than the 5, and you’ll notice a difference between the 7 and HG as well. The Monarch 5 binoculars offer more options in magnifications, so if you’re searching for a 12×42 or 20×56, the 5 is a good bet. Overall, we like the Monarch 5 best, primarily because it’s priced well for what it does. Our pick takes into account specs, performance, and price, which is how we came to that decision. The 7 and HG are nice binos, but it’s difficult to justify the price given the quality. Having said that, if the Monarch 7 or Monarch HG fit your budget, you won’t be disappointed by the performance or build. All Monarchs come with Nikon’s lifetime warranty. While this particular model is discontinued, there are still products available through various retailers — and they are often priced under $200, so the Monarch 3 is worth a look. Here’s our review. Standard sized binoculars such as these, with a good objective diameter, can be used for a variety of purposes including birdwatching, watching sports or concerts, hunting, or when viewing the landscape while traveling or hiking. 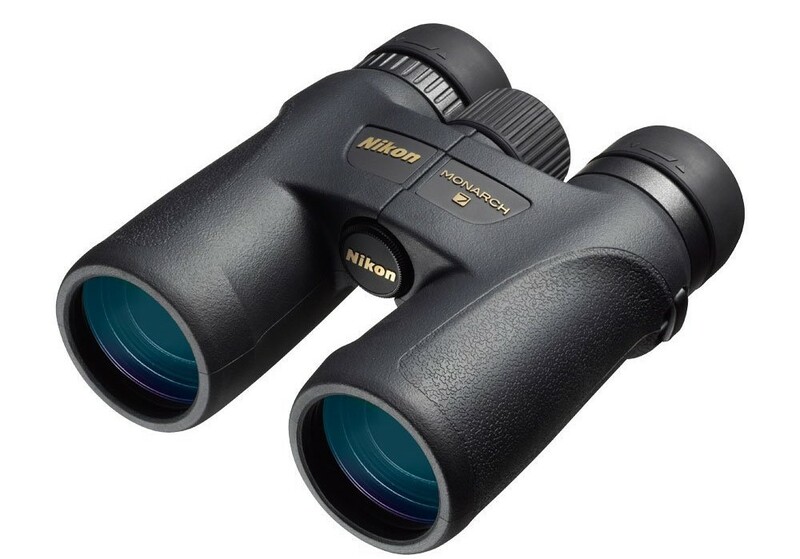 Nikon recommends an “exit pupil” specification of 5 mm or larger for most star gazing, and these binoculars fall slightly below that with an exit pupil number of 4.2 mm. It’s still well above the 3 mm mark, however, and thus could be used for at least some general star and planet gazing. See the Nikon Monarch 3 10×42 here.